We’d love your help. Let us know what’s wrong with this preview of Promposal by Rhonda Helms. Camilla can’t help hoping her secret cr Prom should be one of the most memorable nights of your life. But for Camilla and Joshua, some elaborate promposals are getting in the way. Will they be able to land their dream dates in time for the dance? To ask other readers questions about Promposal, please sign up. This was such a delightful read. It was light and sweet, but not too much that I couldn't stand. There was cheesiness that I normally don't like, but in this book, it somehow worked. Between Camilla and Joshua, I have to say Joshua stole the show for me. I thought he was super sweet and such a wonderful character. I loved his sense of humor. Camilla was not so bad herself, but there was something about her that seemed a little annoying to me. The plot was nice, with a good pace to it. I liked the side stories besides Camilla being "prompose" by someone she didn't feel anything for, and Joshua was asked to do something he had to hide his true feeling. Quite a few times, this book had me ohhh and ahhh because it was so frigging cute. Fun and easy read. Reading this makes me reminisce my own prom experience even though its TOTALLY different from the one that happenedhis book. The characters are okay and the story flowed smoothly however it lacks on the personal side of the characters. I wanted to know them more however the story focuses more on the Prom Hype. Nevertheless, this is a feel light good book that you can also enjoy. Promposal es uno de esos libros que te llena de arrugas. ¿Cómo es eso? Porque sonríes como idiota en cada paso de página. La palabra Promposal no me era conocida, eso sí, lo asociaba con propuesta pero hasta ahí nada más. Si tienes curiosidad, Promposal viene de Prom (la fiesta de PROMoción) y Proposal (propuesta en inglés), lo que me da a entender que este tipo de eventos son importantes (a duras penas a mí me lograron arrastrar a mi graduación, una vez que salí del colegio no quise volver por nada del mundo). Fue un poco chocante ver que soy una rareza hasta para eso. Aclarado eso, pasemos al libro. Promposal es adorable a más no poder, es una de esas rarezas en el mundo Young Adult de ahora ¿En qué sentido? Es que es un libro limpio, por no encontrar otra palabra. Me hace recordar mucho a los primeros libros que leí, tuve la suerte de encontrarme con cosas bastante suaves al inicio pero que me dieron una base sólida en mis gustos de libros. ¡Y ya casi no hay de esos libros! Claro, puedes leer libros que sean así publicados hace 10 o 15 años. Pero ¿publicados actualmente? Es bastante difícil. Quizá no sea del agrado de quienes buscan drama adulta o cosas explícitas, como a los que ya nos hemos acostumbrado con el New Adult, pero si lo que quieres es recomendar un libro a alguien que empieza a leer, Promposal me parece perfecto porque no solo tiene romance de chica-conoce-chico sino también bastante LGTB, cosa que me encanta. Y es uno de los problemas de libros publicados hace 10 o 15 años, ellos no tienen tanta variedad como los de ahora. Así que sí, Promposal es la mejor combinación entre la inocencia de los libros de antes más la aceptación de épocas modernas. Promposal is a cute story about two best friends, Camilla and Joshua, hoping against all odds that they will be able to attend prom with the long time objects of their affections. Camilla is blindsided by an over the top promposal from a classmate she barely knows. There are roses, music and even a news crew. How is a girl supposed to answer in the negative when the whole world is watching – including the proposer with such a hopeful look on his face? I really felt for Camilla. Although her experience is over the top, I think many of us can relate to being in awkward positions that leave us feeling frustrated and powerless. During the weeks before prom, Camilla becomes closer to her crush, Benjamin, thanks to a group project in psychology class. But since she’s already going to prom with her unwanted promposer (I totally just made that up – I think), Benjamin is only willing to take their growing relationship so far. In the end Camilla needs to decide what the smartest AND kindest course of action is. She also has to learn to communicate (not her strong suit in this situation) with both her prom date and her crush. There are plenty of awkward stumbles along the way as Camilla learns to accept that her prom experience won’t be EXACTLY what she expected. Camilla’s best friend, Joshua, has had a crush on his other BFF, Ethan, for as long as he can remember. Their such good friends that Joshua is afraid of admitting his feelings and ruining one of the two best friendships he has. When Ethan asks him to help plan a promposal for another guy in their class, Joshua is heartbroken. But since they are friends he’ll do it. Just as in Camilla’s situation, Joshua has to learn not only how to communicate with Ethan but also decide if the possible fall out of confessing his feelings is worth the risk. As I stated before, I think most people can identify with these two teens and the awkward scenarios they are trying to struggle through. The story is told in the first person POV and chapters alternate between Camilla and Joshua. The style worked well in this book since the two of them were such close friends and they could believably tell parts of each other’s stories. As a reader the only thing I really missed was Benjamin and Ethan’s POV. I was very curious as to what their thought processes were and why they made the decisions they did. Promposal ended up being a perfect afternoon read that let me escape for a little while. I definitely recommend it if you are looking for the same thing. "Camila" has a secret crush that might surprise her with a proposal but everything goes wrong when Camila's acquaintance asked her In front of a news crew and she was forced to say yes. The genre of this book is Realistic Fiction. This book is First person point of view because it has words like I, Me, and We. First of all, Joshua and Camila, I would say that Joshua was really sweet guy and romantic. And I also think that he was a really wonderful character. Second of all, Benjamin also was really sweet but he was really intense at some parts and very romantic. But Camila was a little underestimated and to annoying in some points of the book. I liked how the author made everything flow in. Finally, the conflict is when Camila finds out that Joshua and Benjamin are cousins and that she ruins her chance by going with Joshua. The conflict is person vs person. I like how the author made everything flow in. My favorite part was when Joshua actually gives Camila a surprise by calling Benjamin and telling him to come and share prom next to her side. Also, I really like when Benjamin asked Camila to be her girlfriend because that was the most intense moment. The theme of the this story is Romance because how Benjamin and Camila fight to be together. After all, In conclusion I would rate this book a 5 star because of the intense between Benjamin, Camila, and Joshua.I would recommend This book to people that like romance because the book was very intense and sweet. Promposal was an alright read, but it wasn't great. Camilla and Joshua were okay characters, but i didn't love them. I did feel quite sorry for them both though. Having a crush on one of your good friends, and watching them trying to come up with the perfect promposal for another guy wouldn't be very nice. I would have died from embarressment if i was Camilla. Having a promposal from a guy you didn't really like, in front of a news crew would be awful! When a girl said it was "The most romantic thing she'd seen in her life" i strongly disagreed. Being pressured into saying yes becuase it's going to be on TV, is anything but romantic! I don't get why all these students loved the idea of a promposal so much to be honest. What's wrong with people just saying "Would you like to go to prom with me?" why do they find the need to show off and go over the top?! This was an okay story, but I ended up finding the very notion of a ‘promposal’ to be pretty cringe-worthy. Camilla and Joshua were both okay characters. I felt quite sorry for Camilla and the way that Zach ambushed her and asked her to prom, and the situation that Joshua found himself in wasn’t much better! The storyline in this was okay, but I did find it quite cringe-worthy at points. I found the whole idea of a promposal pretty embarrassing, and I am so glad I never had to attend a prom. I couldn’t quite believe how over-the-top people were, and how seriously they took the whole thing! I mean really? I just don’t get why a stupid high-school dance is so important? There was romance in this, but I didn’t really get into it. The ending to this was okay, but I was pretty glad that the book was over really. This book would have been a lot more interesting if it was solely focused on Joshua with Camilla being a side character. From my personal experiences of adoring novels by fabulous authors, I tend to add all of the author's other works to my TBR list. Okay, maybe not everything, but other novels for sure. The interesting thing with Promposal was that it is written by Rhonda Helms, who mastered her hit new-adult novel, One Broke Girl, which I immediately fell in love with as I started reading it. When I requested this one from the library This review can also be found on A Thousand Lives Lived, check it out for more! From my personal experiences of adoring novels by fabulous authors, I tend to add all of the author's other works to my TBR list. Okay, maybe not everything, but other novels for sure. The interesting thing with Promposal was that it is written by Rhonda Helms, who mastered her hit new-adult novel, One Broke Girl, which I immediately fell in love with as I started reading it. When I requested this one from the library, I had no idea that it is written by her, or literally by any other author I've read a book by. This makes my whole experience ten times better, even though I discovered this "truth" after I flipped over the last pages of this book. Promposal is one of those books that you strictly read for entertainment. You don't find yourself being too strict on structure, plot, characters, or any of that—the concept and events simply captivate you and leave you flipping over the quick pages of the book. It turned out to be great, but then again, it's not one of those YA novels with a concept that you'd like to see again anywhere else. It's just it's one one-time thing about the cheesiness of high school, and every teenage girl's dream to be asked to prom by the hottest guy in school. I must admit that I've had those dreams, too. I can't help myself over squealing because of the romance here. Helms focused on two very, very different couples: Camilla and Benjamin and Joshua with Ethan. She flips between the two perspectives of them dealing with their own personal lives, finding the perfect way to impress their crushes, and them continuing their friendship, confiding in everything. Now that's what I call a memorable relationship. Boy-girl friendships seriously rule, and Joshua alongside Camilla were the perfect match. I loved the portrayal of their "social standings" as well. This was completely fabulous, but then again, the cheesiness at the start of the novel kind of turned me away from reading this. I wasn't a fan of this at first, but knew that I'd obviously finish it because it's such a quick, short read. The whole act of promposals didn't really look fascinating at first. The cheesiness of Camilla, a quiet girl, having a crush on a hot, pretty popular guy is obviously cliché and found in almost every chick flick out there. Do I really want a repeat of my tween years, watching Mean Girls and all of those films? The newest craze of the 21st century teen: promposals. So of course there has to be a book based around them. Personally, I think most promposals are cheesy and over-the-top, so I'm kind of scratching my own head over why I picked this up to begin with. Maybe it was because I had a few expectations going in that didn't play out the way I wanted them to- and that disappointed me. Test of Character: The book is told in alternating POVs of best friends Camilla and Joshua. Both were fine characters, though with little depth outside their high school drama. Their love interests were clear from the beginning, and they kinda just stuck to that. Zach, Camilla's prom date and doting boy, was barely seen. He just came into the story when he was needed as a plot point, or when Camilla was complaining about him. It was clear the author just used him as a plot point, and didn't care about developing him at all. The same is true for Benjamin, Ethan, and any other character outside of the two main characters. Camilla has a huge crush on Ben, who has sat in front of her in class, silent, of course, for the entire year. She's a senior, and hopes that before the end of the year she can talk to him, but when Zach surprises her with an elaborate "promposal" with Ben watching, she is mortified and accepts Zach's offer. Later, she gets assigned to work with Ben on a school project, and the two hit it off, but he's reluctant to pursue her because of Zach's interest. In alternating chapters, we hear from Cami Camilla has a huge crush on Ben, who has sat in front of her in class, silent, of course, for the entire year. She's a senior, and hopes that before the end of the year she can talk to him, but when Zach surprises her with an elaborate "promposal" with Ben watching, she is mortified and accepts Zach's offer. Later, she gets assigned to work with Ben on a school project, and the two hit it off, but he's reluctant to pursue her because of Zach's interest. In alternating chapters, we hear from Camilla's best friend, Joshua, who is really good friends with Ethan, and wants to ask him to prom. He's crushed when he finds out that Ethan is more interested in Noah, and wants Joshua's help in asking Noah out. There are any manner of other promposals in the air, some good, some bad, and Camilla and Joshua both need to figure out how to work through their love lives before they head off to college. Strengths: This was significant in that it had gay characters who didn't drink excessively or participate in any physical activity that I would deem inappropriate and instructional! (No matter who was involved, some things are not right for middle school.) There really wasn't anything that would keep this out of a middle school library-- just a lot of sighing and longing and kissing. Apparently, promposals are a real, if ridiculous, thing. Weaknesses: YA romances are more complex and ... whiny. Middle grade romances are a bit more fun to read. Less handwringing. But for high school, this is pitch perfect. It did seem a little odd that everyone in Joshua and Ethan's lives were completely accepting of their preferences; maybe that's the way it is in high school not, but it wasn't when I was in school, so it's hard for me to get my mind around. 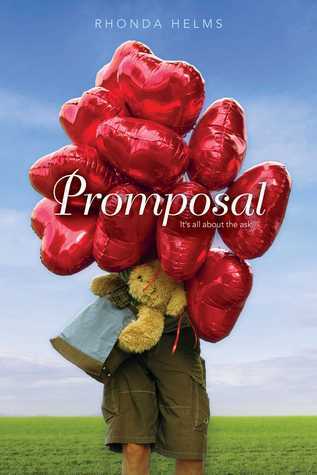 Promposal is a short, cute novel about best friends, Camilla and Joshua, who hope that they will be able to attend their high school prom with the people of their dreams. Camilla receives a huge promposal full of flowers, music, and the attention of what seems like everyone in their school. However, there is only one problem, she does not want to go with this boy, but wants to go with her crush, Benjamin instead. Then we have Joshua who has a crush on their other BFF, Ethan, but Joshua is let do Promposal is a short, cute novel about best friends, Camilla and Joshua, who hope that they will be able to attend their high school prom with the people of their dreams. Camilla receives a huge promposal full of flowers, music, and the attention of what seems like everyone in their school. However, there is only one problem, she does not want to go with this boy, but wants to go with her crush, Benjamin instead. Then we have Joshua who has a crush on their other BFF, Ethan, but Joshua is let down when Ethan asks Josh to help him put together a promposal for another guy in their class. I think so many people can relate to these two teens and their awkward high school years. They both must learn to be brave and communicate their feelings to the ones they want to attend prom with! What sold me the most about this book was the alternating chapters. We get to see things from Camilla’s perspective as well as from Joshua’s. Their voices are so different and it interesting to see them handle the same topics, just in different ways. I would have loved to have had Ethan’s point of view as well, just because he was a part of their group and was so close to both of them. This book was a nice little escape for me and took me no time at all to finish. I am a high school teacher, so the term “promposal” only became familiar to me in the past few years. Students go above and beyond to make these special, and I love that this was included in a book! Props to Rhonda Helms! Being a high school librarian and being wrapped up in kids asking to prom I was intrigued by the title. It captures all the typical teenage scenarios when it comes to asking to prom. The mean girl who says no in front of the whole school, the girls who doesn’t know the guy very well and gets asked on TV, the girl who likes another guy and really wants him to ask her but she gets asked by his cousin. The couple who makes out all the time, and the awkward guy who just doesn’t know how to act. The chapters trade back and forth between two main characters Camilla and Joshua. The profanity in it takes away from the story and is completely unnecessary. The funny thing is the end of the story hardly has any profanity at all. I absolutely hated the ending it abruptly stops. It needs more resolution. I also don’t agree with Camilla’s decision of what she does at the prom. It’s not noble. Joshua is gay and is attracted to another male. It had a lot of potential I just think it’s a broken story. I won’t put it in my library. My Thoughts: Promposal was a really cute one! We are introduced to Joshua and Camilla. Two best friends who fall in love with other people and are there for one another through everything. Joshua is gay and Camilla is straight. Joshua falls for one of his best friends while Camilla falls for a guy in one of her classes at school. I really liked this one. I liked seeing all the other characters plan their promposals and ask people out. I liked the different points of view between Joshua and Camill My Thoughts: Promposal was a really cute one! We are introduced to Joshua and Camilla. Two best friends who fall in love with other people and are there for one another through everything. Joshua is gay and Camilla is straight. Joshua falls for one of his best friends while Camilla falls for a guy in one of her classes at school. I really liked this one. I liked seeing all the other characters plan their promposals and ask people out. I liked the different points of view between Joshua and Camilla too. I liked seeing what they were both going through. I also liked the family aspect. I liked seeing both of their families and things weren't perfect but they made it work. I felt like there wasn't a lot of depth to this one. But that is ok. It got the point across and it was a fun light read for me. Overall: Liked it. Of course both characters had some complications and obstacles to get through but I really liked how things played out. And I liked how prom went as well! It was a fun read. This one was probably more between a 3.5 rating and a 4. But I did enjoy it! 2.5 Stars. A cute, easy read, just maybe a little too easy. A boy asks Camilla to prom in a manner that’s tricky for her to refuse, so she accepts even though she crushes heavily on another guy. Meantime, Camilla’s best friend Joshua harbors a crush on their mutual friend Ethan; however, Ethan enlists heartbroken Joshua to help him ask another boy to prom. A slight twist somewhere along the way, a change of heart, or at least the possibility of a change of heart would have brought a welcome bit of 2.5 Stars. A cute, easy read, just maybe a little too easy. A slight twist somewhere along the way, a change of heart, or at least the possibility of a change of heart would have brought a welcome bit of doubt or suspense as to how this one would work out, I was fine with the couples who ended up together in the end, it just might have been a little more interesting if they hadn’t from fairly early on, seemed like sure things. Ok, the title was seemed shallow. but don't judge it by its title. buku ini diceritakan dr 2 pov brgantian. joshua & camilla. nooo mereka tdk akan dijodohkan pngarangnya d akhir cerita. dua rmaja ini mnghdpi problem msg2 trkait prom. awal sampai akhir baca, aq puas dg cuteness ceritanya. tp aq agak trganggu dg 2 pov, cowok & cewek, yg sering bikin aq rancu. feelings yg aq dpt dr 2 pov ini sama: spt sdg bc pov cewek. bisa dianggap sbg 'cacat' novel ini, tp bs jg dianggap sbg kelebihan (jika Ok, the title was seemed shallow. but don't judge it by its title. bisa dianggap sbg 'cacat' novel ini, tp bs jg dianggap sbg kelebihan (jika mmg disengaja), krn stlh bc smp akhir, 'rasa' cewek ini jd masuk akal dg situasi yg dihdpi di joshua. Promposal is a short, sweet read about prom and the stories that go with it. I finished this book in one sitting, and I would recommend it to everyone–especially those who want to relive memories of their prom night and those who are dreaming to know how it feels like. Rhonda Helms was able to capture the #PromFeels that I was looking for, and I’m glad that I read this book. This book is a good light read, perfect for getting in the mood of prom season. In addition to the entire lack of description in characters, setting, and personality, the whole book was really cliche. Regardless, it had a few swoon-worthy and totally relatable moments. Though the rating is closer to 2.5, I gave it a 3. A very easy and sweet read. I'd recommend this book to those wanting a bit of fluff, a few smiles, and a bucket full of high school angst. I simply adored Joshua and to a lesser extent Camilla. Their respective love interests were also very likeable and so very sweet. This was so bad. Just so bad. Torture to read. I actually think it's a cute story. I thought the cover of Promposal screamed fluffy contemporary and was eager to start the weekend off by immersing myself in an adorable feel-inducing story. However, I completely overestimated this book. Despite its entertaining and light-hearted beginning, the more and more I read, the more I found myself becoming tired of its droning plotline. The romance was the main reason I picked this book up and it saddens me to say that I did not like any of the relationships in this book. I did not care if Benjamin got with Camilla. I did not feel Joshua and Ethan’s ‘connection’. I didn’t even like Niecey and Dwayne - who literally sucked face the entire book and did nothing more - or Madison and Tyler. None of these couples had any chemistry. None of them had anything between them. I wasn't rooting for any of them to get/stay together. I just didn't care and that upsets me because I should care. I wanted to care but there was absolutely zero chemistry between these characters… and that is coming from the ultimate lover of best friend romances (moi!). The characters themselves was also really hard to care for. They were all just so generic that I couldn't feel anything for them. I know I keep saying it but I just couldn't care for them. They were all cardboard cutouts and completely one-dimensional. Oh, and if anything this has increased my horror at the American education system. I cannot believe that prom is a real thing. I mean it is so antiquated! It seems more like a popularity contest than anything. Also, I could not wrap my mind around the idea that anyone thought that a ginormous in-front-of-everyone "promposal" was endearing. The whole idea is crazy to me! Side note: I found the writing style to be easy and fluent but also a bore. The ending was also anticlimactic and kind of predictable. Everyone gets together with who they are meant to. Surprise, surprise. Yawn. This book was a good short read, I finished it in around 2 hours, seeing how it was only around 200 pages. There jsnt a lot to say for this one, I generally liked it and it was a cool read. But the one complaint is the way that the book ended. With the information that Ethan gathered about Joshua I thought the book would end differently, with a different promposal so I was somewhat diapointed with it.